Brown Pundits: "Vanguards of Khorasan"
These days people are engaged in branding exercises in order to foster some or other group identity. The trick is to build up a platform that has some basis in culture and in history and try to shoe-horn your agenda in a manner that makes it acceptable to a substantial fraction of elites and sub-alterns. As an example consider the two principal sub-continental politico-social-cultural brands: Hindutva and Islam. For the record, we are not a fan of either brand because we consider religion to be a divisive force and that in our opinion it should be banished from the public square. What is the Hindutva agenda and how is it helpful towards brand building? Take a specific example: the movement to protect cows (and as an extension promote vegetarianism). The cow occupies a special place in the Hindu pantheon, especially the association with Krishna and the Yadava clan (even in modern day Mumbai the milk supply chain management in our colony as well as many others is a Yadava monopoly). For the recent Lok Sabha polls Amit Shah deployed this save the cows strategy to weaken the Muslim-Yadava alliance in Bihar. Perhaps due to this (as well as many other factors), Lalu Yadav lost, big time (he is back on his feet again, having set up a grand alliance with Nitish Kumar and the Congress). It is surprising (to us) how potent the humble cow is, as a symbol. The liberal-lefties sneer at such "backward sentimentality," claiming (with some justification) that ancient Vedic people used to relish eating cows (and horses and many other animals). As is usual, in their arrogance, the liberals miss the wood for the trees. The point is that Hinduism has evolved, many violent practices like sacrificing bulls and goats is now frowned upon. This year, a major theme in Kolkata is a non-violent Durga. According to devotees, the slaying of the Mahish-asura is merely symbolic, what counts is the killing of the demons within us. Such symbolism allows Hinduism to build bridges within the fold (with Vaishnavites) and without (with Jains) and this evolution contributes to the endurance of Hinduism as a philosophy even in the age of democracy. Shiva and Parvati are not Vedic gods, let alone the idol of the sub-alterns - Kali. Yet, they have been brought within the fold and now a majority are followers of the power couple (and their son Ganesha). Not eating cows (and vegetarianism) is also frequency wise well matched with the modern day religion of environmentalism. There is yet no vegetarian culture as deep rooted and mass based anywhere else in the world. Without becoming as austere as the Jains (even roots and tubers are forbidden), Hinduism is the next best house for vegetarians. Politically, also cow protection is good for branding because the main competitor (Islam) has little to say (doctrinally or otherwise) about vegetarianism (even though there are muslim vegetarians...in India). If we were a Hindutva brand manager we would run a high-profile campaign on pig protection as well - after all one of the ten avatars of Vishnu is the Varaha - but the situation here is a bit complicated. Muslims do not eat pigs because they are sacred, the consideration is that pigs are "unclean" (and so are dogs). Still a campaign on the basis of vegetarianism can help unite a large section of Hindus and non-Hindus, elites and the masses. Even committed irreligious, non-vegetarians like ourselves may not object to a less-meat and eventually meat-less society (from a sustainability standpoint). After all there is a proposal to have meat less Mondays in the USA (and being fiercely opposed by Big Food). There is every indication that vegetarianism will become mainstream in the next few decades in the West. When it comes to Islam there is one solid advantage and one strong disadvantage. Islam dictates that we are all equal before Allah, hence no to caste system and it forbids idolatry, now enforced much more strictly than in the past. Unfortunately, muslims in South Asia have not been able to leave the bounds of caste, Ashrafs (like other elites) continue to impose the 80:20 rule. Also, Indians are strongly in favor of idolatry, this includes Sikhs and Buddhists (where idolatry is doctrinally forbidden). After six decades of partition it may be easier for Pakistanis (less so for Bangladeshis and even less for Indian muslims) to bury the vestiges of a culture replete with references to idolatry. For these reasons above we feel that while Brown Muslim is a powerful brand, it will gain momentum in the sub-continent only when Pakistan and Bangladesh agree to create a social, economic and cultural union (political re-union may not be possible or necessary). The key compromise is that Bangla and Urdu are to be`placed on an equal footing. Our opinion is that it will take many decades before Punjabis agree to this (but we may be wrong). As an outsider we remain puzzled by this move. The Caliphate Brand has proven to be highly successful, people from the world over are joining the ranks of the Daesh. If anything the Khorasan brand will dilute the appeal of the Caliphate and will also highlight the reality of non-Arab cliques. Will the dominant Arabs tolerate such brand dilution? OTOH it may well be the case that with a diversified brand (much like sister companies) there will be greater buy-in from the common people (who may not be all Arabs, now and in the future). Such a step may prove to be helpful in recruiting warrior men (and women devoted to such men) from Greater Khorasan. Only time will tell if this is a net positive for the Islamist brand. Now, within a timeframe of just days, the Islamic State has been sidelined by a new name in the world of Islamic extremism: "Khorasan." 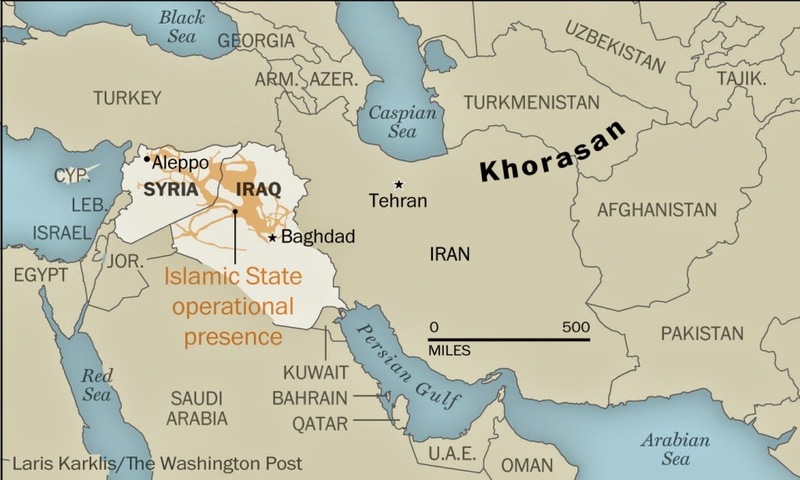 U.S. officials say that Khorasan, often referred to as "the Khorasan group," is a small al-Qaeda linked outfit operating in Syria. They are portrayed as a more direct threat to U.S. interests than the Islamic State, which is still largely focused on operations in Syria and Iraq. U.S. officials say that their strikes against Khorasan appear to have been a success, killing the group's leader, Mushin al-Fadhli. However, some analysts are perturbed by the lack of information about the group and why it was targeted. Even an examination of one of the most basic elements of the group – its name – paints a complicated and inconclusive picture of what the group actually is, and why it is being targeted. After the region was taken over in an Arab conquest in the 7th century, Khorasan became a part of the Umayyad Caliphate, and with that, part of early Islamic culture. Notably, a widely discussed (though disputed) Hadith speaks of how "black banners will come out of Khorasan" in the end times. Will McCants of the Brookings Institute notes that the prophecies derive from the 8th century Abbasid revolution, a revolution that began in Khorasan and saw the end of the privileging of Arabs over non-Arabs in the Islamic empire. In part due to its place in Islamic history, the term Khorasan is used by modern Jihadist groups, especially those based outside Arab states. The online magazine of al-Qaeda in Afghanistan is called “Vanguards of Khorasan," for example, and J.M. Berger, an independent terror analyst, says that al-Qaeda has often signed its communiques as emanating from Khorasan over the years.